Loosen up clutch cable adjuster. Unhook cable end from clutch arm. Remove clutch cover bolts and cover. Remove the 5 clutch bolts and springs. Here's what the inside of your pressure plate looks like. Use 1/2" air or electric impact wrench and remove the 32mm clutch nut. With an impact wrench, you don't need a clutch holding tool. When removing the plates, keep them in the correct order (that's one reason to have a Triumph Service manual). After removing the 32mm nut and the "outside" facing bellville washer. Insert slightly tapered 6mm pin into the 6mm hole to line up the split primary gears. Or you will never get the center spacer and bearing out. 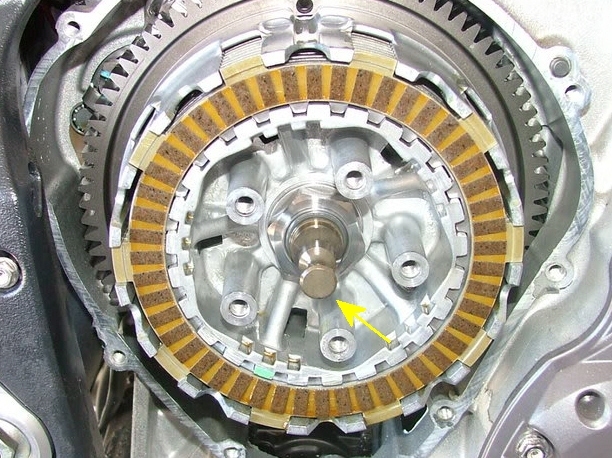 With the split gear held in alignment, gently remove the clutch center bushing and clutch center bearing. Might take 3 hands to hold 2 pliers and gently tap the clutch basket. Use that tenacious grip that 2 good, new Snapon needle nose pliers are known for. 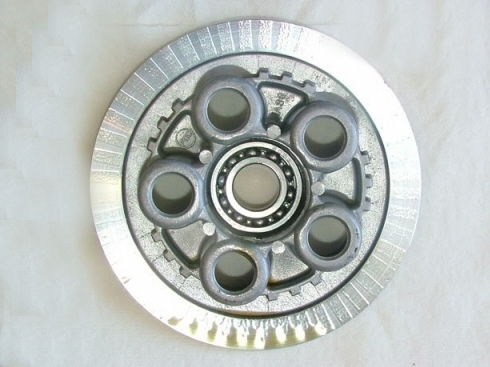 This is what it looks like under the clutch basket. 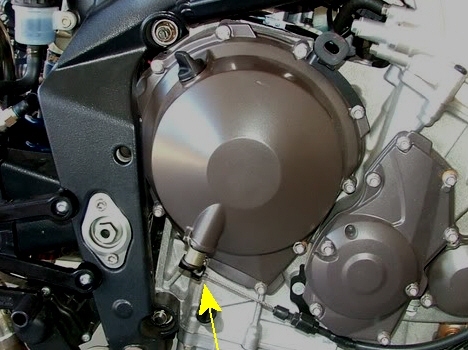 Remove these 2 Torx screws and the clutch oil splash plate. 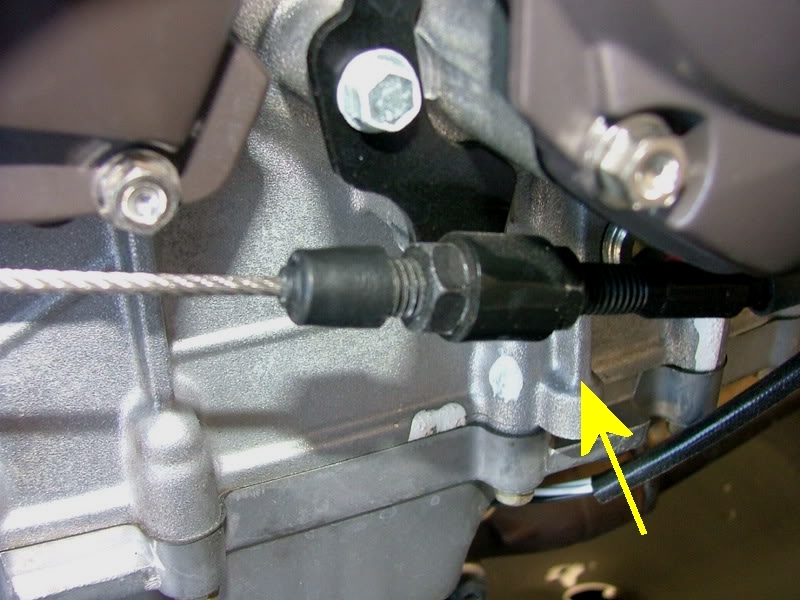 On the left side of the bike, remove the shift linkage from the shift shaft and slide the shift shaft out - to get access to the shift star. Unscrew the center allen bolt for the stock shift star. Pretend the bolt is out in the pic, lever the arm away from the star (to make the star easier to remove), reach in with those good Snapon needle nose pliers and remove the stock star. 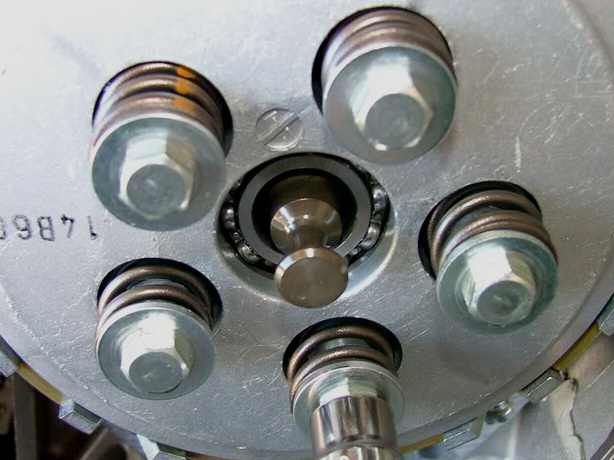 When roughly in place, lightly thread in the retaining screw in and rotate the Shift STAR until you feel it drop into it's shift drum pin slot. It doesn't have to be in any particular gear position. Rotate the shift star till it reaches the end of it's travel (it will be 1st or 6th). Note that the stock detent arm doesn't need to be installed while you are installing the Shift STAR. Might be easier to take the arm off - if you don't have 3 hands. Good idea to use a drop of LocTite - (6-8ftlbs torque). Check that the bike shifts through all the gears. You will have to turn the clutch shaft back and forth to let the gear engagement dogs and slots to line up to complete each shift. It goes about 51% of the way, then the detent rotates some more (because of the spring loaded detent arm), but not all the way to the STAR valley, then rotate the clutch shaft back and forth, and then, when the dogs and slots line up, the STAR will rotate the rest of the way, till the detent arm is in the valley. "Snick". Repeat for each gear. Go 1st through 6th and back down a few times. If it doesn't shift through all the gears, something's not aligned in the shift mechanism. Click here to view a trained professional do it. This checks the shift arm and star operation. If the detent arm doesn't follow the star peaks and valleys, the arm and / or spring are binding. If when you go to the "neutral" 1/2 height "peak" and it's still in gear, then the Star is not properly lined up to the shift drum "pin" on the backside of the Star. Definitely use LocTite on the clutch nut and torque to factory specs. If in doubt at all - do what your manual says. Do all safety checks necessary. Test ride carefully! Enjoy your new sweet shifting! comments / corrections / additions?